Clear with purple shot glass, "Butler" imprinted in purple on one side. 4" tall 1 1/2" diameter. Grey beanie with front logo and Nike swoosh on side. Grey swoosh cap with the "Grizzly" logo imprinted on the front bill and "Butler" on back. Flexible, one size fits most. Dark grey dri-fit cap with the "Grizzly" logo embroidered on front and small "Butler" on back. Flex fit cap - one size fits most. Ladies polo with "BUTLER" embroidered in gray on the upper left front of the shirt. Also available in dark gray or blue. 100% polyester. 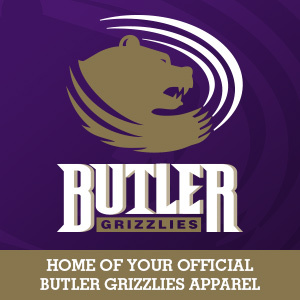 Purple dri-fit polo "Butler Grizzlies" embroidered in white on the upper left front. 100% polyester. 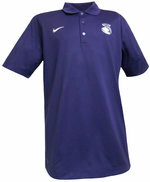 Nike dri-fit purple polo "Butler" and the Grizzly Powerhead embroidered on the upper left front in white. Three button placket, straight hem. 100% polyester. 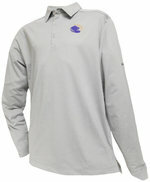 Gray long sleeve polo with Grizzly power head logo embroidered on the upper left front. 92% polyester 8% spandex.